Weddings sure have changed over the years. And, we think that’s wonderful. Your special day should be exactly what you want it to be. And, the right special effects team will guarantee that you’ll have the wedding of your dreams. Whether you are going for elegant, romantic, over the top fun, don’t overlook the role of special effects. And, make sure you hire the right event production company. You shouldn’t have to worry about a thing on your big day, especially whether or not your event is going to go off without a hitch. Special effects lighting that simulates the look of water and fire is an amazing addition to any theme or style. Use them as a backdrop for your reception, or for a special feature during your first dance. They’re affordable, and a good production company is going to be able to help you come up with ideas about how to use them for the most impact, and in a way that will set the tone for your event that you want. These are one of our most favorite special effects for weddings, and ballroom events of all kinds. Setting a lighting display to music, when done right, can be magical. Now, we don’t want you to think about wild holiday lights gyrating to AC/DC or crazy DJ strobes. That’s not at all what we’re talking about here. Moving head lights, set to roll with the motion of your favorite music can create subtle, artful effects when you stream them across the dance floor, or cover a coved ceiling with a rainbow of spiraling colors. You can create a simple wash of light so subtle that people may not be aware of what it is that makes the room seem so magical, but you’ll know. There is really no end to what you can do with custom lighting for your wedding. If you’ve got a favorite flower, or if there are shapes and symbols that represent your wedding theme or your relationship, they can be turned into unique, light-projected images that fill the walls of your reception. Or project an image onto the dance floor that holds a special meaning for you and your new spouse. A good event product company will help you choose just the right color, saturation, and size of your images. The first place to start is by choosing the right people to help make your special day the best it can possibly be. 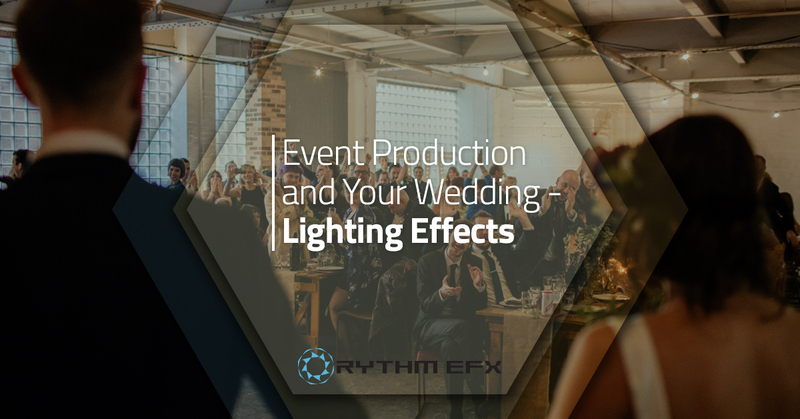 Rhythm EFX has the expertise and experience to make sure your day goes smoothly and that you and your guests are thrilled with the lighting special effects. We’re a family business located in Northern Colorado. We love it here, we love our community, and we love our customers. Your satisfaction is our number one goal. So, in addition to our outstanding equipment and artistic skills, we’ve honed our customer service and project management skills to make sure your happiness is 100 percent guaranteed. We serve Denver and the Front Range. So, give us a call today. Let’s talk about your special day and how we can help you make it everything you’ve always wanted. We look forward to hearing from you.